In much the same way that the Beatles would later lead the British invasion into America, the group was also responsible for the Mersey Beat boom in Britain -- with many Merseyside bands rising to somewhat lesser fame on the heels of the Beatles' incredible success. 'The Mersey Sound' documentary attempted to analyze the Mersey Beat phenomenon. 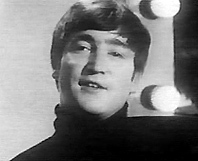 It would be first telecast in Britain a little over one month later on October 9th, John Lennon's 23rd birthday. JOHN: "The best thing was (Love Me Do) came to the charts in two days. And everybody thought it was a fiddle because our manager's stores send in these... what is it... record things." JOHN: "Returns. And everybody down south thought 'Oh, aha! He's buying them himself or he's just fiddlin' the charts,' you know, but he wasn't." GEORGE: "Actually we'd been at it a long time before that. We'd been to Hamburg. I think that's where we found our style... we developed our style because of this fella. He used to say, 'You've got to make a show for the people.' And he used to come up every night, shouting 'Mach schau! Mach schau!' So we used to mach schau, and John used to dance around like a gorilla, and we'd all, you know, knock our heads together and things like that. Anyway, we got back to Liverpool and all the groups there were doing 'Shadows' type of stuff. And we came back with leather jackets and jeans and funny hair-- maching schau-- which went down quite well." JOHN: "We just wore leather jackets. Not for the group-- one person wore one, I can't remember-- and then we all liked them so it ended up we were all on stage with them. And we'd always worn jeans 'cuz we didn't have anything else at the time, you know. And then we went back to Liverpool and got quite a few bookings. They all thought we were German. You know, we were billed as 'From Hamburg' and they all said, 'You speak good English.' (smiles) So we went back to Germany and we had a bit more money the second time, so we wore leather pants-- and we looked like four Gene Vincents, only a bit younger, I think. (smiles) And that was it, you know. We just kept the leather gear till Brian (Epstein) came along." PAUL: "It was a bit, sort of, old hat anyway-- all wearing leather gear-- and we decided we didn't want to look ridiculous going home. Because more often than not too many people would laugh. It was just stupid. We didn't want to appear as a gang of idiots. And Brian suggested that we just, sort of, wore ordinary suits. So we just got what we thought were quite good suits, and got rid of the leather gear. That was all." GEORGE: "We do like the fans and enjoy reading the publicity about us, but sometimes you don't realize that it's about yourself. You see your pictures and read articles about George Harrison, Ringo Starr, Paul and John-- but you don't actually think 'Oh, that's me. There I am in the paper.' (smiles) It's funny. It's just as though it's a different person." RINGO: "When we go home, we go in early in the morning when we've finished a job, and the kids don't know you're at home. But if they find out, where I live, they get the drums out and beat it out! (laughs) 'Cuz it's a play street and, you know, there's no traffic or nothing bothering them. Once when the boys came for me-- they popped in to see me Mum and me Dad, you know-- we had to go out the back 'cuz there were twenty or thirty outside. And they wouldn't believe me mother, you know, knocking and saying 'Can we have their autographs.' So it built up so much. There was about two hundred kids all around the door, peeping through the window and knocking." RINGO: (laughs) "In the end, me mother was ill, you know-- terrified out of her life-- with just all these kids and boys and girls, you know." 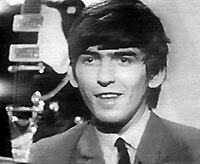 GEORGE: "They send us alot of Jellybabies and chocolates and things like that, just because somebody wrote in one of the papers about presents and things that we'd had given to us. And John said he'd got some Jellybabies and I ate them. But ever since that we've been inundated. We get about two-ton a night. (smiles) But the main trouble is they tend to throw them at us when were on stage. (laughs) And, uhh, once I got one in my eye which wasn't very nice. (holds finger to eye) In fact I haven't been the same since." JOHN: "It all sounds complaining, but you know, we're not. We're just putting the point that it affects your home more than it does yourself, you know, because you know what to expect but your parents and family don't know what's happening." JOHN: "'How long are you gonna last?' Well, you can't say, you know. You can be big-headed and say, 'Yeah, we're gonna last ten years.' But as soon as you've said that you think, 'We're lucky if we last three months,' you know." 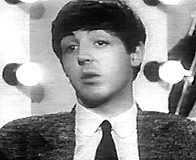 PAUL: "Well, obviously we can't keep playing the same sort of music until we're about forty-- sort of, old men playing 'From Me To You'-- nobody is going to want to know at all about that sort of thing. You know, we've thought about it, and probably the thing that John and I will do, uhh, will be write songs-- as we have been doing as a sort of sideline now-- we'll probably develop that a bit more we hope. Who knows. At forty, we may not know how to write songs anymore." GEORGE: "I hope to have enough money to go into a business of my own by the time we, umm, do 'flop.' (laughs) And we don't know-- it may be next week, it may be two or three years. But I think we'll be in the business, either up there or down there, for at least another four years." RINGO: "I've always fancied having a ladies hairdressing salon." 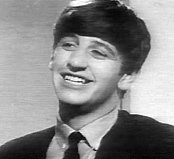 RINGO: (undeterred) "You know, a string of them, in fact! Strut 'round in me stripes and tails, you know. 'Like a cup of tea, Madam?'"